A member of the West Midlands Regional Data and Intelligence Network has raised a query with us about local names for Middle Layer Super Output Areas or MSOAs (find an explanation of what super output areas are below). Each MSOA is identified by a nine character code (for example E02000001). The Office for National Statistics gave all Local Authorities the opportunity to provide “local names” to give local meaning to these MSOA codes, examples of which you will find in this document (XLS, 852KB). From the West Midlands, only Walsall, Sandwell and Shropshire have provided these local names. Can anyone shed light on the others? I’m looking for approved names that are in use by Local Authorities. Please email me if you can help – I’ll post updates here. Lower Layer: Minimum population 1,000, mean population 1,500. Built from groups of Output Areas. Commonly known as Lower Layer Super Output Area (LSOA).There are 34,378 LSOAs in England and Wales. Middle Layer: Minimum population 5,000, mean population 7,200. Built from Lower Layer SOAs. Commonly known as Middle Layer Super Output Area and abbreviated to MSOA. There are 7,193 MSOAs in England and Wales. Upper Layer: Commonly known as Upper Layer Super Output Area (USOA). I have e-mailed Oliver Nicholls with the approved names for the MSOAs in Coventry. Thanks for this Tom. Email received and forwarded to the original enquirer. I will liaise with colleagues at ONS to see whether your info can be integrated in their online spreadsheet. Thanks for responding to Oliver’s blog. I am trying to collate some local names for the MSOAs in the region as we intend to publish cancer statistics at this level in the future. I noticed there are a number of names which are hyphonated which when I brought them into ArcView defaulted to an unusual group of characters which then had to be edited out – was there a particular reason for using hyphens rather than commas or ‘and’? There are some other names which might have benefitted from a comma or an ‘and’ but this is not present e.g.Finham South Cheylemore which appears to be area names strung together but they don’t mean much unless you know where the comma or hyphen should be e.g I assume it is Finham & South Cheylesmore as Cheylesmore appears in the names of two other areas generally to the north of this. The ones I had particular problems with were South Park New Centry and Whoberley Central, neither of which seemed very intuitive. I daresay someone has been going back and forth to councillors on this one and if that is the case fine but if not I might be tempted to edit them on our lookups to make them more user freindly. Are you intending to submit your names to ONS or are you aware that ONS abandoned this issue? Please email me the list of IDs for Solihull with a map that shows locations and I’ll endeavour to send some names back. Note that these will be subject to change, so please leave the capability to readily change names on your databases. Also, we’ve also done this for LSOAs. Thanks for looking at Solihull for me – I will send a png file to Oliver to forward on to you (don’t think I can upload to the site). Map and list emailed over. Thanks for your help. 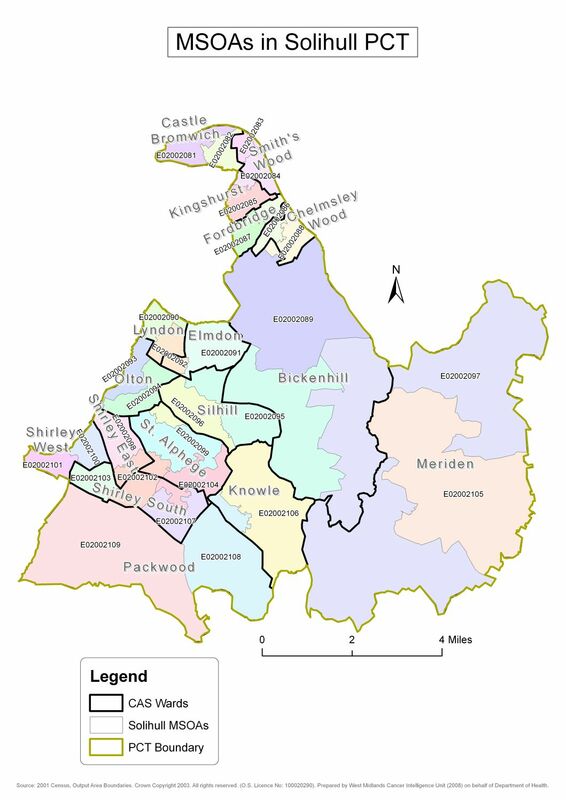 I’ve uploaded the Solihull map for anyone wishing to access it. I am reaching the final stages in collating local names for MSOAs. I am waiting for 2 more local authorities to provide their lists then I should be able to collate a complete list for the region by mid-May. Is anyone aware of this same exercise being undertaken in other parts of the country? I have tried to extend my list of Local Names to all of England on behalf of the UK Association of Cancer Registries. So far this has yielded a few additions to ONS ‘official list’ but by no means a complete list. The other problem with this kind of harvested list is that each local authority that has provided them have applied different naming conventions and have different field lengths. I am happy to share what I have. I have asked ONS Geography through its User Group to pick up this piece of work and whilst receiving a broadly positive response I get the feeling it is not considered high priority. Requests from other users may help to raise the importance of local names. Could you pls let me know how would I get a the MAP of MSOAs in the East of England with their name and ID.